I just wanted to post a quick update. I'm on a bit of a hiatus from my XNA Terrain tutorial series for a few days as I'm attending the Heartland Developer's Conference in Omaha, NE. One more day remains and so far the conference has been outstanding. 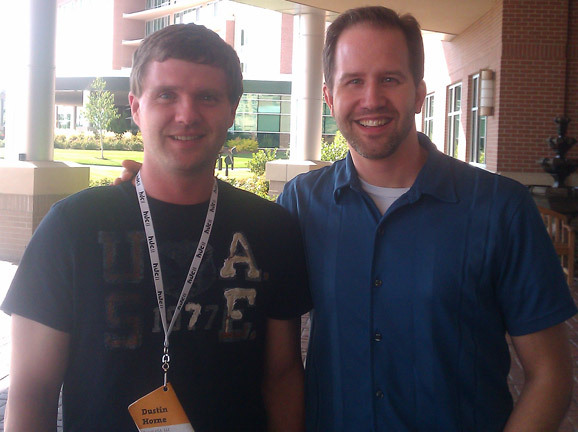 I had the pleasure of having lunch with Scott Hanselman today as well as attending his keynote and off-the-cuff presentations. There are some exciting things coming out of the Microsoft stack soon and I'm sure I'll be blogging about them as I dive into them. In this second part of the terrain series, we're going to build some of the data structures we'll be using for our terrain. If you haven't already done so, please read Part 1 of the terrain series. Today I'm going to switch gears and write something a little more fun. This is the first article in a series dedicated to developing a QuadTree based terrain for XNA 4. Terrain generation is a hot topic amongst XNA developers and a question that arises often. There are several different approaches to developing terrain. The simplest method is the “brute force” approach where all terrain data is rendered every frame. With the power of today’s hardware, this is definitely a viable solution for games with simple, low geometry terrains that target the PC, but it’s an approach that doesn’t scale well when terrain becomes more complex. Another approach to terrain is to implement a Level of Detail (LOD) algorithm that sets out to reduce the complexity of the terrain as it gets further away from the user. This step alone can increase efficiency and produce phenomenal gains in performance while raising the complexity and detail of the terrain. There are several different approaches to LOD, and even more ways to improve performance beyond simply subdividing the terrain.